Love is indeed a matter of the heart but smart people always rely on their brain to make the right decisions when relationships get serious. Many people turn to private investigators to find if their partner is telling the truth about their past. You would be surprised to find out how many people lie about their marital status. 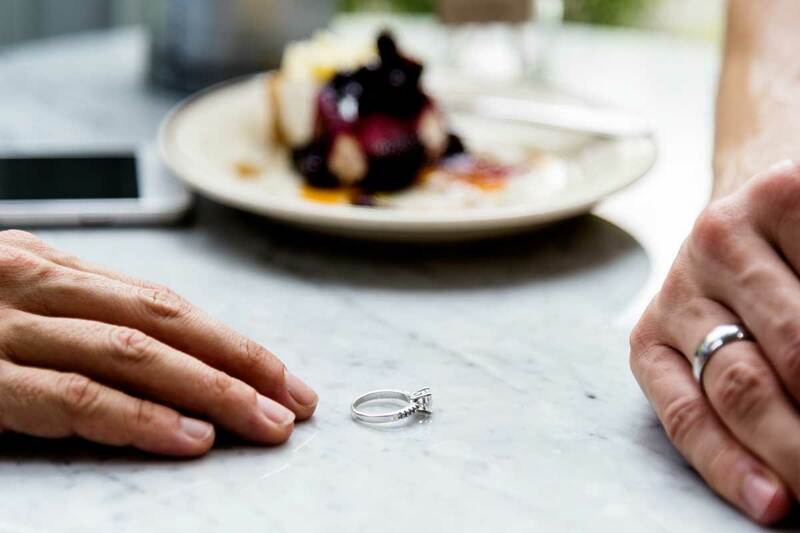 Private investigators also prove to be very helpful when it comes to drafting premarital nuptial agreements when the parties involved in the relationship want to protect their hard work and assets and find out exactly who they’re marrying. And this is not a bad thing! Being cautious is always better than finding out the ugly truth when it’s too late to avoid disappointment, heartbreak and even financial loses. If you need to know someone is married or divorced, keep reading the following tips. It’s true that marriage records are public information but getting to them is not exactly a walk in the park. Marriage records are stored at the county, town or city level. You can find where to request access to a marriage record here. However, getting access to a marriage record is sometimes accompanied by tough restrictions. For example, in Virginia, you can access a marriage record only if you’re one of the parties to the marriage unless the marriage took place more than 25 years ago. In some states and counties, you can get access to marriage certificates online but you would have to do an extensive search to find out where the subject of your research lived so you would know where to look for. You should also know the full, pre-marriage name of one of the parties and have an idea about the time range when the marriage occurred. Of course, it would help a lot if you knew the state and county where the marriage took place. If you have the necessary information, you can start your search by visiting the National Association of Counties website to get access to the public records of the respective county. Select the state, choose the county, follow the public records link, fill in the information for the person of interest to you and click search. You’ll get access to one or more listings and, if applicable, you’ll see the copy of the marriage license or information about it, including the names of the bride and groom and date of the marriage. Divorce records are also available to the public, so it wouldn’t hurt to search there too. If you can’t get online access to divorce records, you can always make an appointment with the clerk of the county and search for the divorce records there. However, even if you know the previous residences of the subject, you can’t trust completely the result of your search because there’s always the possibility for the marriage to have taken place somewhere else. And this will take you right back to where you started. Maybe you don’t know a way to get access to the marriage records but you definitely can search the person of interest online and review their social media profiles. A marriage usually leaves some traces, especially nowadays, when there’s this vital need to let the world know about the events that take place in our lives. Social media profiles abound in information and, even though it’s very possible for the person of interest to have a secret profile if they’re hiding details about their past, like a marriage or a divorce, you can simply use reverse image search to uncover their profile. You just need to upload an image of the person into the Google Images search bar and the search will unveil results that include that photo or similar photos. If you want to find out if the person is divorced or widowed, you can check out their social media history or even the social media of their close associates to find evidence of past marriages and relationships. If a social media investigation doesn’t return any results, you can always try to do it the old fashioned way: check for announcements in the newspapers. The endeavor can be quite challenging and tiring but it might get you the proof you need. When searching in databases, try narrowing down your search by using the information you already have about the subject. This will definitely save you some time and help you find relevant information. If you can’t find a marriage record or relevant social media posts about the person of interest, you can always search through wedding gift registries, a rather useful tool in such matters. You’ll have more chances to find out what you need if the wedding took place in the last 5-10 years. Even though not everyone uses a wedding gift registry, those who do will have their information saved in there for many years. The most popular wedding gift registries are The Knot, Macy’s, WeddingWire, William Sonoma, and Pottery Barn. Give it a try! Or save a lot of time and effort and hire a private investigator. 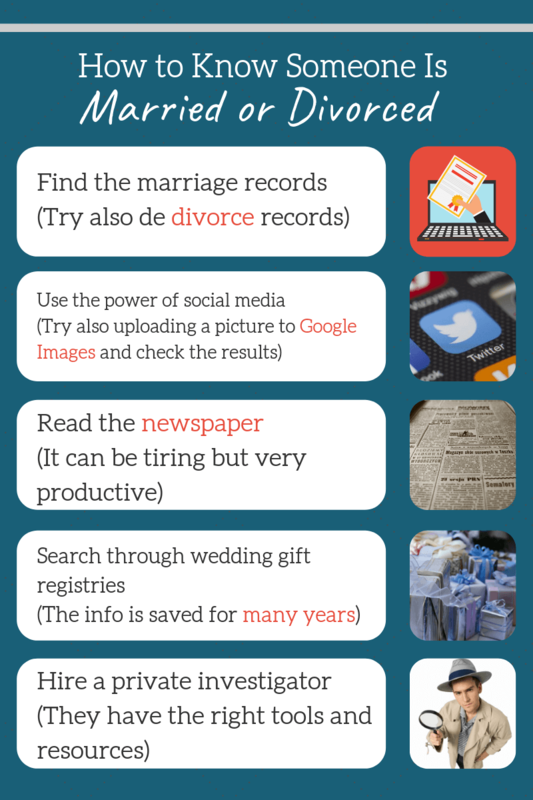 Most of the tools mentioned above are not reliable and trustworthy, especially if you can’t find a way to access marriage records. Private investigators have the right tools and resources to uncover many things about a person’s past fast, even if they don’t have too many details to begin with. Private investigators usually start with an advanced background check into the person of interest to find out their previous addresses and associations. They will also find out if the subject lived under a different name, if they’ve owned properties alone or jointly and even if they’ve owned a car. The information obtained from specialized databases will eventually indicate if the person they’re investigating was or still is married and who they could be married to. If they’ve lived for a long time with a person, the chances are they’ve been married, and if they’ve shared property, like houses and cars, with someone, the assumption that they are or have been married is often right. It’s enough for private investigators to find a pattern and follow it and they’ll unveil the truth about someone’s marital status.